hehe...gotta love our babies. It's the independence and attitude that we know and love and can drive us to pull our hair out! Sebastian thinks it's a game. Ignoring him is the only thing that works for me. Good luck! Our back yard is fenced in so I just let them out & in whenever they want. Chumley loves it outside. It doesnt matter if its sun, rain ,or snow. But Belle doesnt & is wanting back in shortley after going out. Its a bad habit I know but if I really need to get Chumley in (like if I am going to work) I use treats. He loves Milkbones so all I have to do is shake the box. Suddenly even if he is at the other side of the yard he comes running. 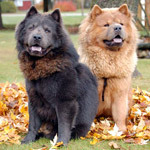 cherriemater have you tried using that chow jealousy against them? sometimes I do this when Belle has come in but Chumley is just sitting on the steps using that selective hearing I will open the door and start talking to Belle funny thing is ususally that selective hearing is turned on and jealousy gets the best of him...he has to come in and get some luvs too. Hmmm ... I'll have to try that. I usually treat the first one to sit when we come in and Max has figured that out so when we get into the garage, he usually makes a beeline for the door, then sits and waits in the utility room looking over his shoulder while Leo comes straggling in. It's funny. It may also be that they're just learning their words, too. Like, "inside" means "I'd like to go in, we're not going to hunt right now," while "INSIDE INSIDE" means "I'm freezing my patootie off and I want to go in RIGHT NOW!" They're starting to get the hang of the different way it sounds and are responding. But, I will certainly starting praising the one who responds first. That's a great idea.